Aircraft approved aluminum honeycomb with aluminum skins has a lightweight aluminum core and is moisture and corrosion resistant. This backing is not only lightweight, it also has high strength. Aluminum honeycomb is also flame resistant and noncombustible. The epoxy adhesive has been tested to hold over 45,000 pounds per square foot (psf). A category 5 tornado is known to produce winds of only 404 psf. StonePly’s bond strength is 100 times stronger than what a category 5 tornado exerts. The epoxy is the same as the epoxy used on aircrafts traveling at mach speeds. StonePly only works with stone suppliers that they have a relationship with and trust. We want to provide the finest stones to our customers. The stone slabs are selected with care. We only work with the best materials. Almost any natural stone can be used including granite, marble, and limestone. The natural stone comes from the quarry in the form of blocks. The stone blocks are then cut into 1 ½ inch slabs. 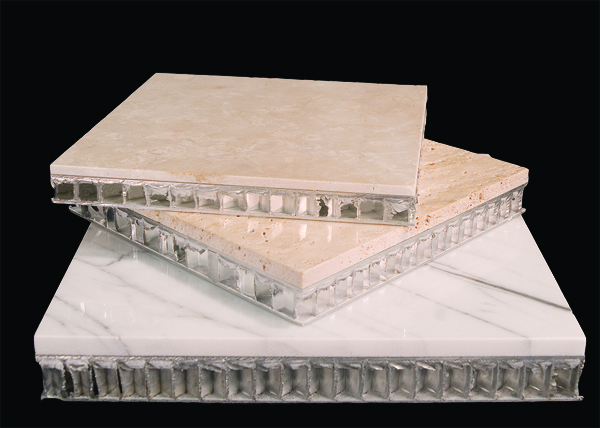 StonePly bonds the high strength aluminum honeycomb to both sides of the slab with epoxy under pressure to guarantee coverage over every square inch. Once the epoxy has set, the slab is sawn in half. The pieces are then cut to size from the stone slabs. From here it is sent through a machine to polish, honed, or finish to the customers specifications. Before the StonePly stone panels are crated, they are carefully inspected for chips, scratches and other damages.